TRIBECA — 'Tis the season to pack on the pounds. From scrumptious holiday cookies and decadent hot chocolate and egg nog, to grandma's famous strudel, the holidays are rife with dangerous menus that threaten to bring end-of-the-year weight gain. But experts say a holiday feast survival road map can help you steer clear of over-indulgence. "Healthy meals can be festive as well," said Patricia Nicholas, a registered dietician at New York-Presbyterian Hospital/Columbia University Medical Center. "And hopefully, you have been making healthy changes to your diet all year." If bread smeared with butter is your downfall, try swapping it with whole wheat pita, Nicholas said. If you're tempted to load up your plate, try eating just a small forkful. And whenever you're hosting a holiday party, be sure to offer fresh fruit and vegetable plates as a side dish to help others on the same mission stay healthy. 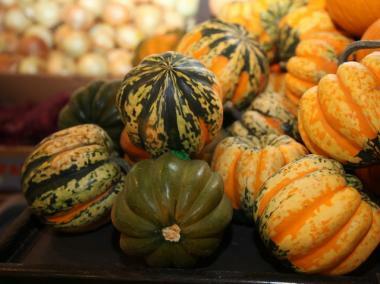 A a seasonal display of carnival squash from California at TriBeCa's Whole Foods. "The weight gain is in all the side dishes," said Drew Rosen, a Whole Foods health and wellness team member at the chain's TriBeCa store, at 475 Greenwich St. When butter-soaked mashed potatoes or creamy macaroni and cheese beckon, try frozen butternut squash tossed with paprika — a savory, healthy dish that's still a hit with guests, he said, adding that the aisles of TriBeCa's Whole Foods are a sea of alternatives to calorie-exploding treats like pecan pie or a cream-infused green bean casserole. But if you have to have your favorite dish, try a spoonful rather than a plate full, Rosen said. "If you're [saying], 'Oh my gosh, the mac 'n cheese is so good,' then take a small serving," explained dietitian and registered yoga instructor Julie Marx, who teaches at YogaWorks in SoHo. "It's better than denying yourself." Other holiday weight-watching strategies include giving away sweets and leftovers to spread holiday cheer — and avoid tipping the scales. "Give it to skinny friends or to guys. It's so easy for guys to lose weight." said Monica Brown, a Long Island City resident. "But, maybe not to your husband, " she added, correcting herself as she looked up at her husband with a sheepish grin. Sometimes the weight gain is spurred by holiday food "pushers," who try to pressure you into breaking your diet so you can try their special seasonal meals, experts said. Laurence Martinaud, an East Harlem-based nutrition consultant, relies on a medical condition to help avoid fattening foods. She tells co-workers she is gluten-intolerant to avoid sugary foods at the office. "If you say it's a medical issue, then people leave you alone," she said, "You have to say to yourself, 'Is it worth the calories if it's not going to be heaven?' Unless there's chocolate, then don't bother." Angelo Butico, 50, said he practices food diplomacy to avoid fatty selections his relatives cook for fear of offending them. "I push it around the plate and don't eat it," he said. But not all New Yorkers stress about packing on a few pounds during the holidays. "I'm the opposite — I say bring it on, " said Danille Oteri, a Washington Height resident who owns her own food business, Culinary Ancestry, which compiles old family recipes into personalized cookbooks. 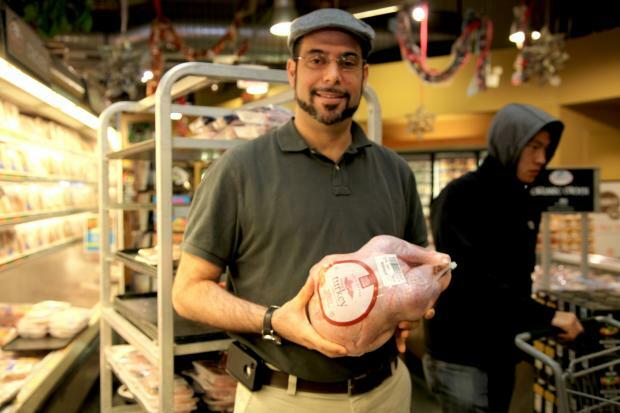 "Holiday foods are my favorite, and I have a business in Italian food." The proud Italian-American was on her first grocery run to buy supplies to make her first her first batch of struffoli, an Italian-style doughnut served only at Christmas. "If you're not going to have struffoli for Christmas, then you're not going to have it at any other time of the year," Oteri said, standing next to her friend Luisa Rasiej. "You can't have struffoli in June or July, that's just wrong!" Rasiej added. Still, even a few pounds on the scale at the end of the year isn't a sign you've failed, experts noted. "We have this big stigma about being thin and healthy, and the normalcy is to be slower and reflective during this time of year." Marx said. "But it's not a ticket to go into free fall either."